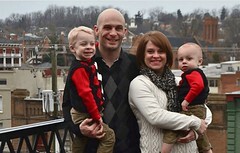 Chris Hewitt has been a Member and servant of the Waynesboro church or Christ since 2005. He has been working as a Registered Nurse for five years and will complete a Master’s degree in Nursing from South University later this year. He will be eligible to sit for board certification as a Family Nurse Practitioner. Oddly enough, Chris has a phobia of germs. But he enjoys helping others achieve better health. He has a special interest in caring for sick children. He hopes to eventually start a healthcare ministry that offers free health services to the disadvantaged. At Waynesboro, he serves in whatever capacity that is needed from the Lord’s Table, Prayer, Agape Leader, local outreach, to Vacation Bible School alongside his brilliant wife Rachel. Chris and Rachel have two sons: Jackson and Harrison. Chris loves 1 Corinthians 1:26-30 because it reminds him that God desires a humble heart! Further, this verse reminds him how God continually changes him to be more like Jesus. Moreover, it reminds him that everything good, all of his accomplishments, occur because of His grace and power. Chris enjoys hearing “All who are Thirsty,” “Revelation Song” by Phillips, Craig, and Dean and “This is Amazing Grace” by Phil Wickham. Chris fills his spare time with Brazilian Jiu Jitsu, Kayaking, Fishing, and Target Shooting. He likes movies and stories about heroes! He believes our world needs more heroes!